These tender, moist doughnuts are baked, not fried — which means they're a piece of cake to make (pun intended). Having friends over for breakfast, and not sure who's eating gluten-free (or dairy free, for that matter)? These treats are the perfect solution. Fill the wells of the doughnut pans about 3/4 full (about 1/4 cup of batter in each well). 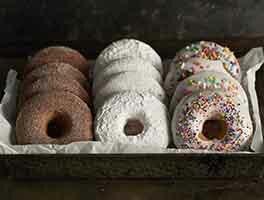 Bake the doughnuts for 15 to 17 minutes, or until a toothpick or cake tester inserted into the center comes out clean. Remove the the doughnuts from the oven and let them cool in the pan for about 3 to 5 minutes. After they've cooled a bit, loosen their edges, and transfer them to a rack. 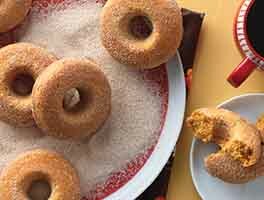 While the doughnuts are still warm coat them in cinnamon-sugar. You do this by hand, just rubbing each doughnut with the sugar coating, or you can gently shake them in a bag with the cinnamon-sugar. Return each doughnut to the rack and cool completely before enjoying. Store in a partially covered container at room temperature for several days. Enjoy as is or slightly reheated. Yield: 12 to 14 doughnuts. I made these for a work event. They turned out great. I am wondering though, can the recipe be halved? Thanks. 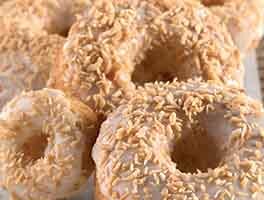 These donuts are awesome! Made 1/2 of recipe & got 8 full size donuts. We tossed them in a cinnamon mixture of 1/2 cup sugar with 1 T. cinnamon. Yummy! We are freezing the last two donuts to see how they taste onced thawed during school week too. Thank you for this Celiac friendly recipe! Excellent donuts. A very forgiving recipe. I realized after putting in the 2 Tbsp & 1 Cup GF flour I had gotten the wrong canister and had used the GF baking mix. Not wanting to throw it away I completed it with the remainder of GF flour it called for and crossed my fingers. They still turned out great. Another GF winner! The whole family is gobbling them up. 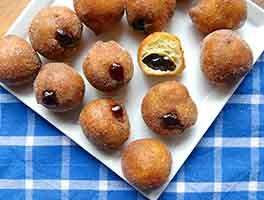 The texture is more like a muffin than a doughnut but they taste great! We put them in a shallow bowl to do the cinnamon sugar dredge. Next time we will only do the cinnamon sugar coating on the ones we know we are eating right away as it dissolved into the doughnut overnight. Yummy! Oh my gosh! These were so good! I added ground cloves and used a muffin pan. Nobody would know these are gluten or dairy free. This recipe is an absolute gem!!!! Thank You!!! I made this recipe this AM. Fantastic! My family did not even know they were gluten free. I did not have donut pans so used muffin pans. Worked great. Used brown sugar instead of the granulated and was sweet enough. Quick easy recipe took me 1/2 hour to make. Will definitely make again! I thought these were great. I also think the batter has other applications, whoopie pies, pumpkin roll. Very very good! These taste ok. I wouldn't say they are donuts, a round muffin maybe.